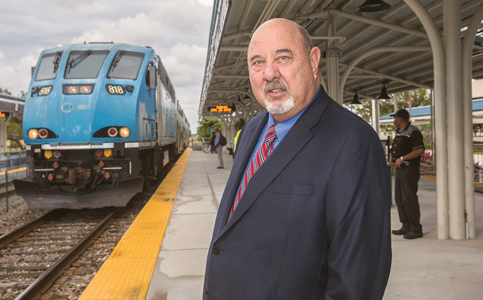 Though the South Florida Regional Transportation Authority runs Tri-Rail, Jack Stephens isn’t out to compete with local transportation systems and does everything he can to support mobility in Miami-Dade, Broward and Palm Beach counties. Mr. Stephens’ personal mission of public service aligns with that of the authority. Just as he is driven to public service and integrity, the authority “will support anything that will take cars off the road, reduce congestion and create mobility for all our citizens,” he said. When negotiating with partners, the biggest challenge is not communication but money, Mr. Stephens said. Though the authority has gotten close, it hasn’t secured dedicated funding for the system but relies on state, federal and county money in addition to ticket revenues. Miami-Dade transit is in dire need of transportation solutions, Mr. Stephens said, but he’s not worried about rails becoming irrelevant as new technology makes waves. “There isn’t a one-size-fits-all solution, but it all has to come together to make a system that works for the public,”he said. Miami Today reporter Gabi Maspons interviewed Mr. Stephens last week. Why is not MDX money used to support this needed tri rail expansion? Tri-Rail needs to run later at night and more frequently at all times. Arsht Center and AS Arena audiences can’t get home with today’s schedule. The FEC tracks from downtown Miami northward are double tracked already and signaled, with quality 136 pound rail and concrete crossties, like the SFRTA tracks that host TriRail. Iris connection is in place, as is the Northwood 1 connection in North Palm Beach. Only stations would have to be built. In South Miami, the CSX track is abandoned south of SW 152nd St, but is intact. It could be used to extend service to Homestead, but would have to be rebuilt. It could be double tracked for passenger service from South Dade to Bird Rd, but the right of way narrows from there north to Flagler St and there is room for only one track. The county has talked of Tri Rail or some other service using the east west line paralleling SR 836. The South Dade Busway should never have been built and it would have made sense to keep the FEC line to Florida City intact. The towns all along the South Dixie Hwy corridor want rail service as has been promised since 2002 when the people voted for the half penny tax. Tracks laid on the ground are less expensive than a roadway and can be done quickly. The main concern is money. Mayor Gimenez says its too expensive for rail to be built along the South Dade Corridor. What if another way could be found to pay for the rails to be restored? The Port of Miami is going to reach capacity soon if the projections are correct and will need an off port overflow container facility, a kind of inland port for containers. The FEC intermodal facility in Miami Springs will also reach capacity since trains of containers are being sent from the port into the FEC facility. This will hinder the capacity to haul domestic trailers and containers and another facility will be needed. The Homestead/Florida City area has massive warehouses like the ones in the airport area close to the FEC intermodal facility in Miami Springs. Such a facility could be built in the area between US 1 and Card Sound Rd in the Florida City area and could put trucks from the keys and South Dade on trains instead of US 1, Krome Ave, Okeechobee Rd, and the Florida Turnpike. Since this facility would be important for commerce, State and Federal funds would be available for the construction of the rail line, as well as money from a private rail company, maybe FEC again or someone else, since such a facility would be a traffic generator. Passenger trains could also roll on this line and since the population on the south Dixie corridor is concentrated on transit oriented development and is higher than on the CSX Homestead line, the former is the superior route. FEC and CSX, or a successor company, since CSX wants to sell the Winter Haven to Miami line. In addition, the best connection from the Dixie corridor to Miami International Airport is the Ludlam Corridor. This corridor is 100 feet wide for most of its length. It has ample room for stations and double track, as does the South Dixie corridor. The people on the south end of the Ludlam corridor say they want a trail and there is room for rail and trail on this line. it would connect to the line along the Airport, which the county and state want for passenger service anyway. Freight will make the rail lines possible and will pay for their upkeep and construction. The Cemex Card Sound quarry can ship rocks by rail like on the CSX airport line and the FEC Medley line and perhaps an auto unloading facility can be built with minimal expense in the new intermodal facility. New jobs, better transportation, less pollution and wear and tear on streets and highways. Whats not to like?